Custom Handmade Ballpoint Pen, wood pen. 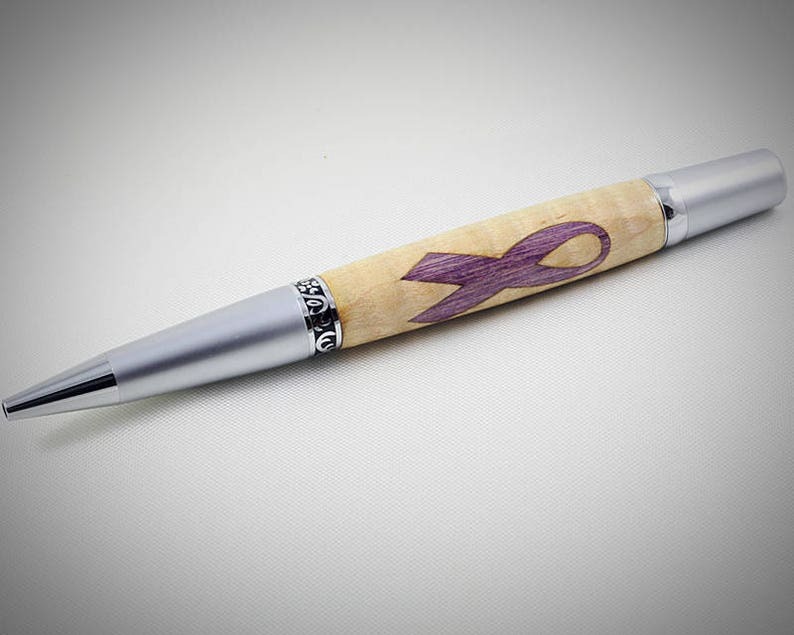 This handcrafted ink pen features a Purple Ribbon inlaid into Curly Maple. The purple ribbon is used to represent so many great causes! The purple ribbon is most commonly used to raise awareness for Animal Abuse, Alzheimer's Disease, Domestic Violence, Epilepsy, Lupus, Sarcoidosis, Crohn's Disease, and Pancreatic Cancer. +Barrel Material Dyed Maple Purple Ribbon inlaid into Curly Maple. +This pen accepts a “Parker ®” style refill. Length 3.875” (9.84cm) Diameter .22” (5.8mm). Ohio Penworks installs a premium quality Schmidt medium point easyFlow 9000 refill in the buyers choice of black or blue. “Parker ®” style refills are manufactured by numerous companies including Acme, Fisher Space Pen, Parker, Monte Verde, Pelikan, Schmidt & Visconti. They are available wherever office supplies are sold. AQlso accepts a variety of Gel Pen Ink Refills in the same Parker Style. Breast Cancer Awareness Allumilite Pen Blank for Sierra and Sierra Clones.